This morning has been a bit of an adventure for some reason. Driving all over town to collect ingredients for a birthday dinner I am making this weekend. There was an "incident" involving a lot of orange cones. There was a lot of laughter from a particular road crew. A great deal of embarrassment from me. Followed by me getting a giant coffee just to put myself over the edge and make me an even bigger spaz than I already am today. I figured I should just come home and stay out of society until I could pull myself together...or until it's time to collect Ada from school...at which point I'm sure there will be something else for me to report! Anyway, none of that actually has anything to do with this post. Last weekend on French Food at Home, Laura Calder made all these glorious little desserts with various seasonal fruits. They were so pretty and most of them were so uncomplicated. So of course I'm going to try several of them. 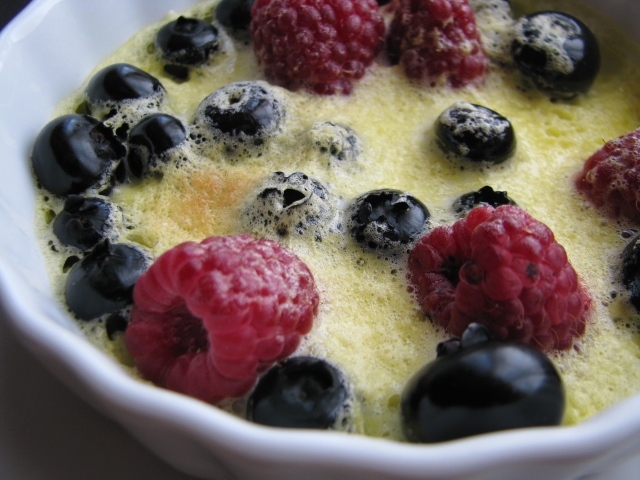 The first one is this berry gratin with champagne sabayon. "The sauce you need is based on a foamy mixture called a sabayon (a cousin of the light, egg-based Italian dessert zabaglione). A sabayon is made by beating egg yolks with a liquid over simmering water until thickened and increased in volume. ( the liquid can be water, but champagne or wine is often used for a savoury sabayon.) The sabayon must not get too hot during cooking or it will become grainy: if it begins to feel warmer than body temperature, remove the pan briefly from the heat, beating continuously, until the mixture cools. Then return the pan to the heat and continue cooking. Sabayon may be served warm or cold; a cold sabayon is beaten off the heat until cooled. Sabayons may be sweet or savoury. They may be served simply as a sauce, often flavoured with an alcohol, or they may form the base of some mousse mixtures. They may also be used for sweet or savoury gratins. Cornflour is sometimes added for stability." 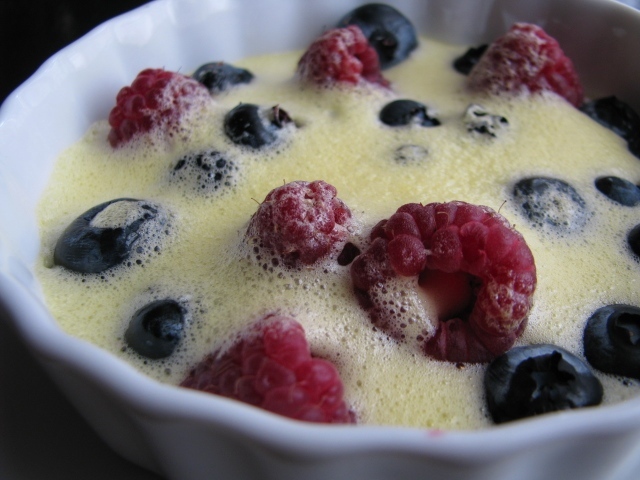 After I made this I kind of thought it was like a creme brule...minus the creme...this is very light and airy and yet still rich in texture - but NOT a custard. 4 handfuls mixed berries - I only had blueberries and raspberries in the fridge so that's what I used. 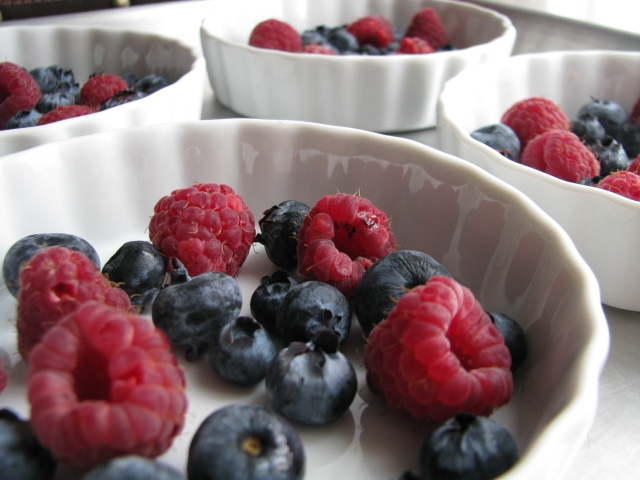 evenly distribute those berries among the 4 ramekins - place all of them onto the baking sheet. 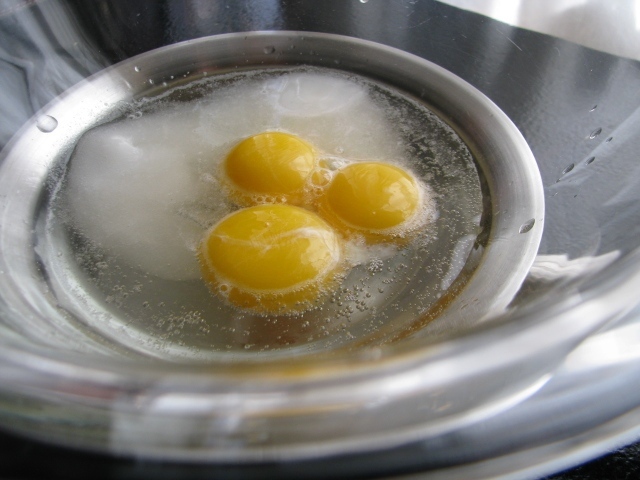 In a glass bowl add the champagne, sugar and egg yolks. Lightly whisk to blend, then place this bowl onto the pot of simmering water. Whisk continuously until mixture has almost doubled in volume. Spoon the Sabayon evenly amongst the 4 ramekins. Place the tray under the broiler. Keep an eye on it - needs to come out just as the tops begin to bubble and tan.